Environmental News Network - What is the most common form of ocean litter? Cigarette butts are the most common form of marine litter. Broken bottles, plastic toys, food wrappers ... during a walk along the coast one finds any of these items, and more. In all that litter, there is one item more common than any other: cigarette butts. 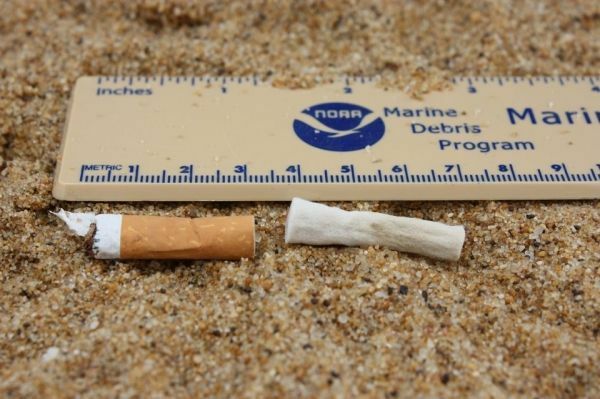 Cigarette butts are a pervasive, long-lasting, and a toxic form of marine debris. They primarily reach our waterways through improper disposal on beaches, rivers, and anywhere on land, transported to our coasts by runoff and stormwater. Once butts reach the beach, they may impact marine organisms and habitats. Most cigarette filters are made out of cellulose acetate, a plastic-like material that’s easy to manufacture, but not easy to degrade. The fibers in cigarette filters behave just like plastics in our oceans, the UV rays from our sun may break the fibers down into smaller pieces, but they don’t disappear. One solid filter ends up being thousands of tiny microplastics.